Keeping up-to-date on happenings about The Kubert School is a great way to find out more about us. Stay informed with The Kubert School News. 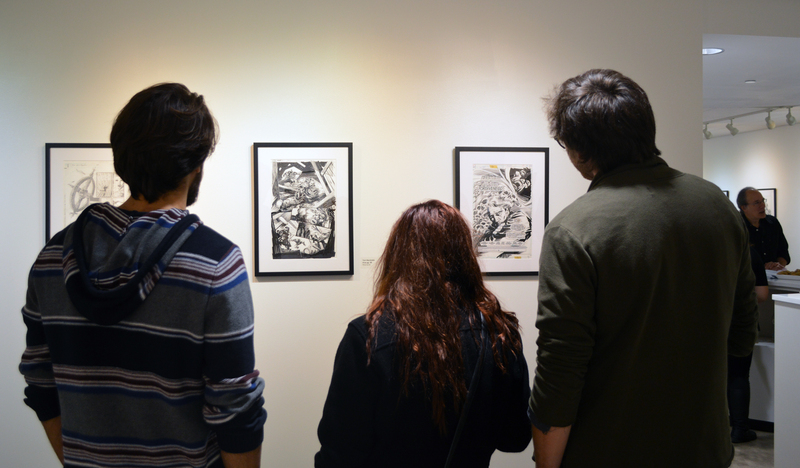 Find out what’s new at The Kubert School. 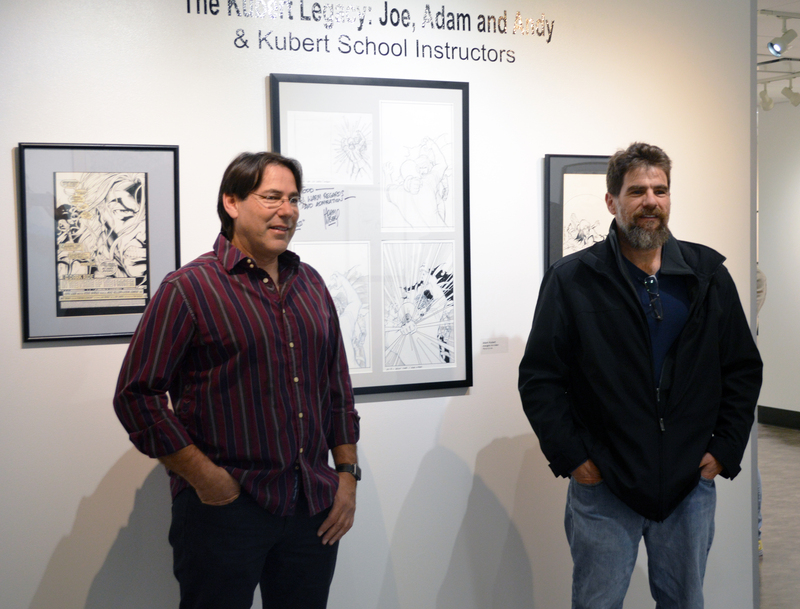 Thursday, November 9th was the opening party for the exhibit; The Kubert Legacy: Joe, Adam and Andy. 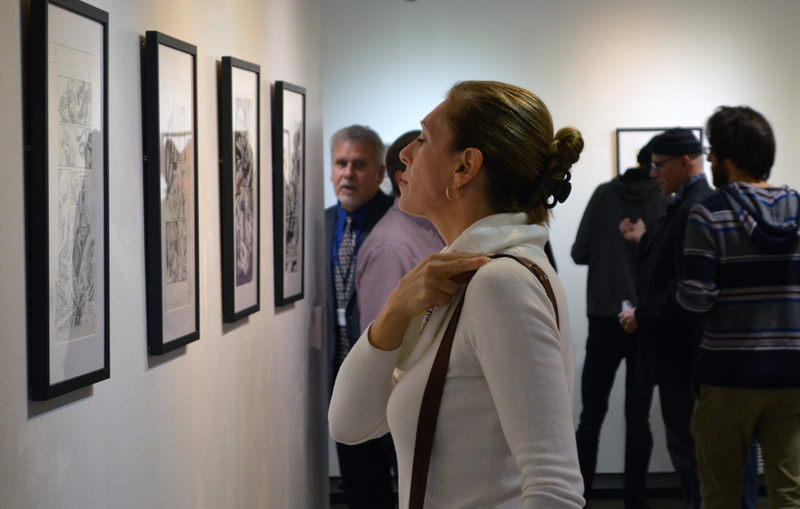 The exhibit is a rare opportunity to view original comic book art created by Joe Kubert and his sons Adam and Andy. Along with the art displayed from our founding family was the work of 21 instructors from the Kubert School. There was quite a turnout for the event and the show remains on display at the County College of Morris, 214 Center Grove Road in Randolph, New Jersey until December 20th. New Jersey Comic Expo brings a celebration of comic books and pop culture that showcases the exceptional works of talented writers, artists, illustrators and creators of all types of pop culture. The 4th annual New Jersey Comic Expo to be held November 18 & 19, 2017 at the New Jersey Convention and Exposition Center, situated in Edison, New Jersey. The Liberty Science center will be hosting events all day in the kids area and there will be exciting programming all weekend hosted by your favorite comic creators. Guests include The Kubert School, Scott Lobdell, Larry Hama, Amy Chu, Kevin Maguire, Kieth Giffen, Dennis Calero, Scott Koblish, and many more! Get your tickets now at http://newjerseycomicexpo.com/ use promo code KUBERT for a discount. Our own third-year students will be manning our table, ready to accept commissions and offering prints and artwork for sale. Halloween comes but once a year but we like to think we know how to celebrate it here at the school. 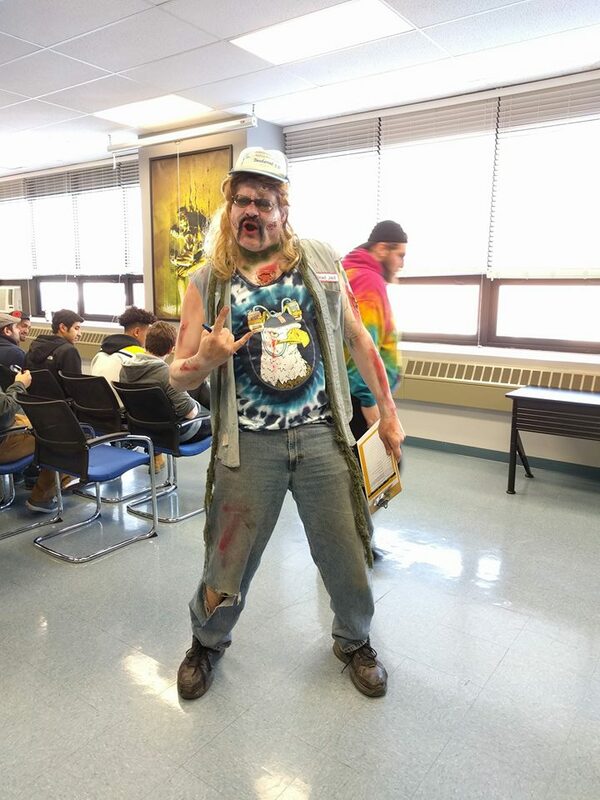 Our annual costume contest allows the students to show all of their costuming skills and if there's a bit of skit to go along, all the better. Master of ceremonies, Undead Jed - instructor Darren Auck. 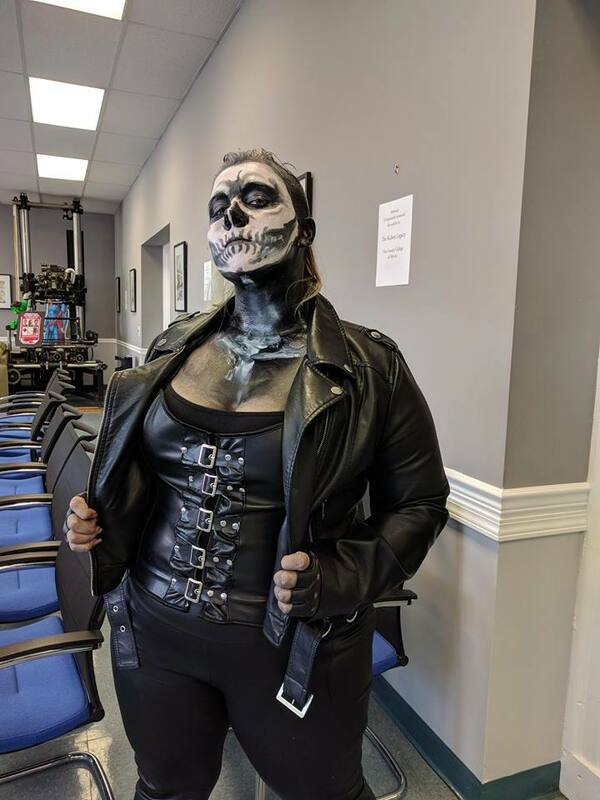 1st place costume winner Sarah Madura. 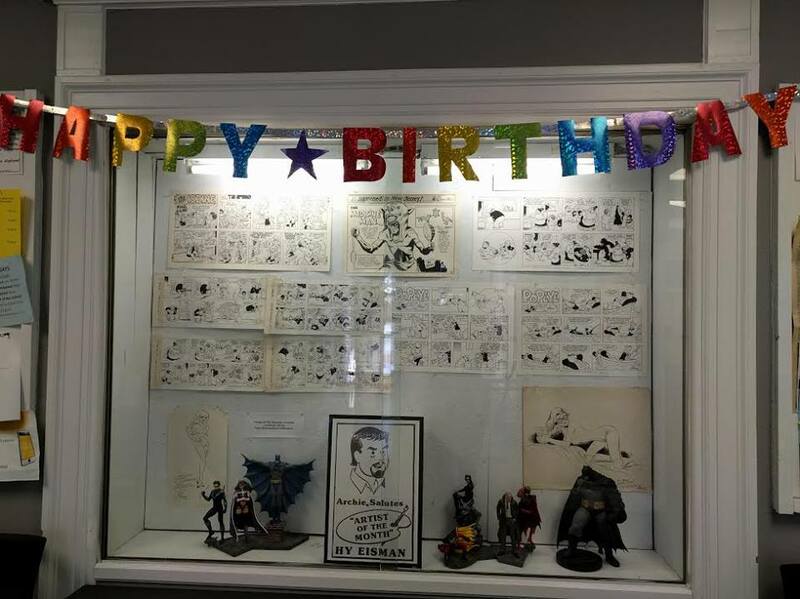 County College of Morris will be holding an art exhibit in honor of comic legend Joe Kubert. 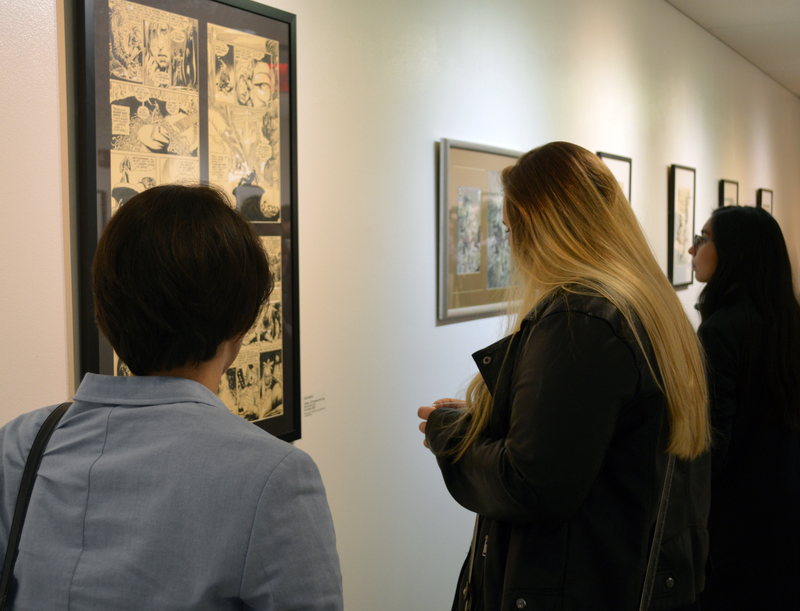 The exhibit, “The Kubert Legacy: Joe, Adam and Andy Kubert,” runs from October 30 through December 7 in CCM’s Art and Design Gallery. 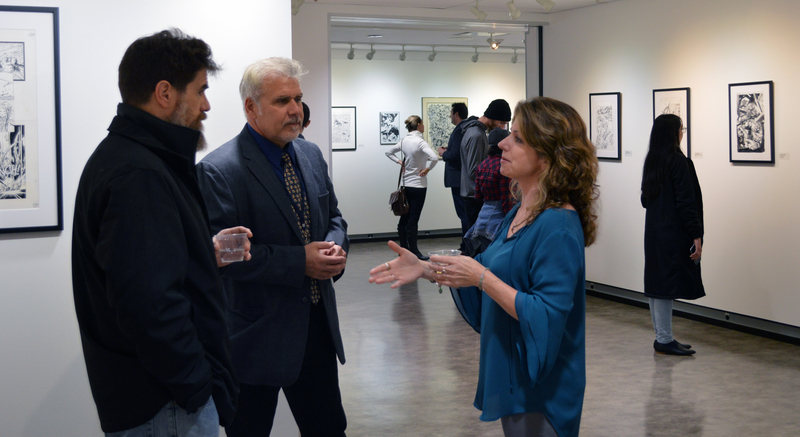 A reception will be held in the gallery on Thursday, November 9, from 5 – 7 p.m. Included in the exhibit will be the art of Kubert and his sons Adam and Andy Kubert. Also to be included are artwork by Kubert School instructors, including Tom Mandrake, Jan Duursema and Rags Morales. The Kubert School in Dover was founded by Joe Kubert and his wife, Muriel, in 1976. His sons continue to run the school, which is devoted to the art of cartooning. The reception and exhibit are free and open to the public. The gallery is located in the Learning Resource Center on CCM’s Randolph campus, 214 Center Grove Road. 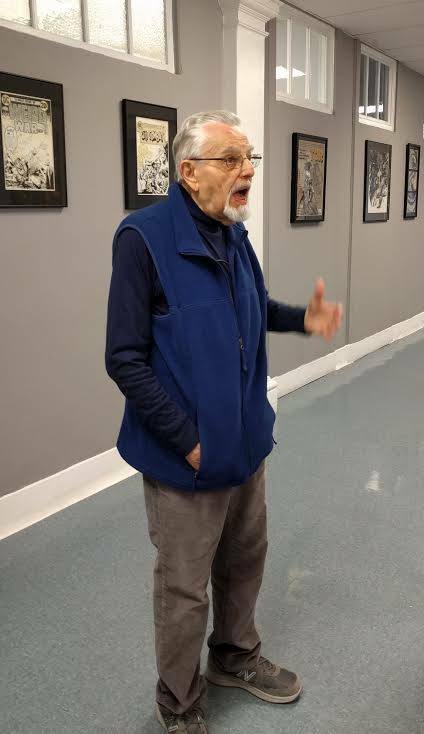 Gallery hours are Mondays and Wednesday, noon to 5 p.m.; Tuesday and Thursday, noon to 8 p.m.; Friday, noon to 4 p.m.; and the first Saturday of the month from 11 a.m. to 2 p.m.
Kubert (1926 – 2012) is widely known for his work on the DC Comics characters Sgt. Rock and Hawkman. He is also known for working on his own creations such as Tor, Son of Sinbad and the Viking Prince, as well as collaborations with writer Robin Moore in making the comic strip Tales of the Green Beret. Kubert was inducted into the Harvey Awards’ Jack Kirby Hall of Fame in 1997 and the Will Eisner Comic Book Hall of Fame in 1998. Adam Kubert is currently working for Marvel Entertainment on projects such as Wolverine, The Avengers vs. X-Men and Peter Parker: the Spectacular Spider-Man. Andy Kubert is working for DC Entertainment on Flashpoint, The Dark Knight III: Master Race and the New Challengers. Classes for the 2017 - 2018 school year start Tuesday, September 5th! We're super excited to welcome all our new students as well as our returning second and third-year students. A jolly rib-tickling welcome to our latest staff member, Mr. Bones. Mr. Bones will have office hours in our newly refurbished Life Drawing Room. Stop by and wish him well in his new position at the school. School's out for summer but the graduates of the class of 2017 had one more opportunity to take advantage of. On July 13 our graduates were invited to Disney's international publishing office in Manhattan to have their portfolios reviewed. Earlier this spring Tomas Palacio, Executive Editor of Disney International Publishing visited our school to talk to our students and review the third-year students portfolios. At that time, he invited the future graduates to Disney's office so that other editors could review their work. The school's event coordinator Lloyd Briggery worked out the logistical arrangements for the visit. The Kubert School will be attending The Garden State Comic Fest, July 8th, and 9th. The Comic Fest takes place at the Mennen Arena, located at 161 Hanover Ave. Morristown, New Jersey. Along with Adam Kubert, a number of students, former students, and instructors will be attending and representing their artistic skills in Artists Alley and throughout the show. Thank you Mr. Adams - Our 40th graduating class. This year we celebrated our 40th graduating class on Tuesday, May 23rd with a dinner and ceremony for our graduating students. Our special commencement speaker this year was the legendary artist, Neal Adams. Neal who is recognized as one of the leading industry talents regaled the crowd with a humoristic story of his first exposure to the work of Joe Kubert, and followed that with some sound financial advice that every freelancer beginning their career should take into account. The evening ended with Adam and Andy Kubert distributing diplomas to the 22 members of the Class of 2017. As we finish up the school year and get ready to send our third-year students out into the world we're certain we've given them the tools to start a career in comics, illustration and the graphic arts. To further implement their education and get them off on the right foot, possibly with a job or at the very least a business connection we invited a number of publishers along with representatives of design studios to come to the school and review the graduating students work. Over the course of the year, they've met with representatives from; DC Comics, Marvel Comis, Disney Worldwide Publishing, Dynamite Entertainment, Aftershock Comics, Valiant Comics, IDW, Graphix (a division of Scholastic Publishing), Studio 2.0, Fractured Pixels, Topps, and Hasbro. We'd like to thank all the editors and representatives from these companies and studios for the time. It's that time of year again, our third-year students are getting ready to graduate and say goodbye, but before they do we've got some plans in store for them. Each year we invite publishers to come out to the school and take a look at our current crop of artists and it all start this week. On Wednesday, April 26th editor Anthony Marques, from Dynamite Entertainment will be reviewing portfolios. On Friday, April 28th Mike Zagari from Aftershock Comics will be here and he's bringing his friend Tomas Palacios, Executive Editor at Disney Publishing worldwide. We've got more reviews planned including one from editor Adam Rau, from Graphix/Scholastic and a field trip to the offices of Valiant comics. 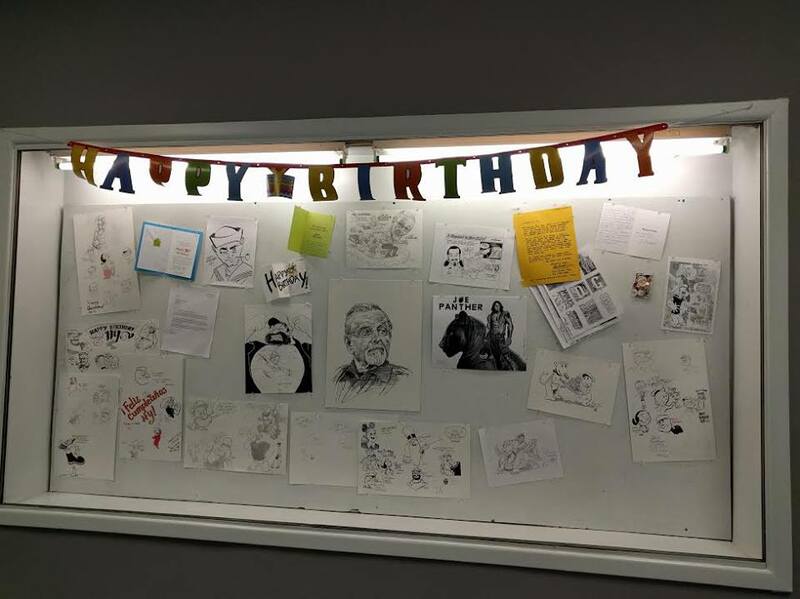 Cartooning legend Hy Eisman has been teaching at the Kubert School since it's inception in 1976. Hy entered the comic strip field in 1950 and worked on several newspaper comic strips, including Kerry Drake, LittleIodine, Katzenjammer Kids and Popeye. At the school, Hy has taught humor and lettering to thousands of our students and is much beloved by our alumni. 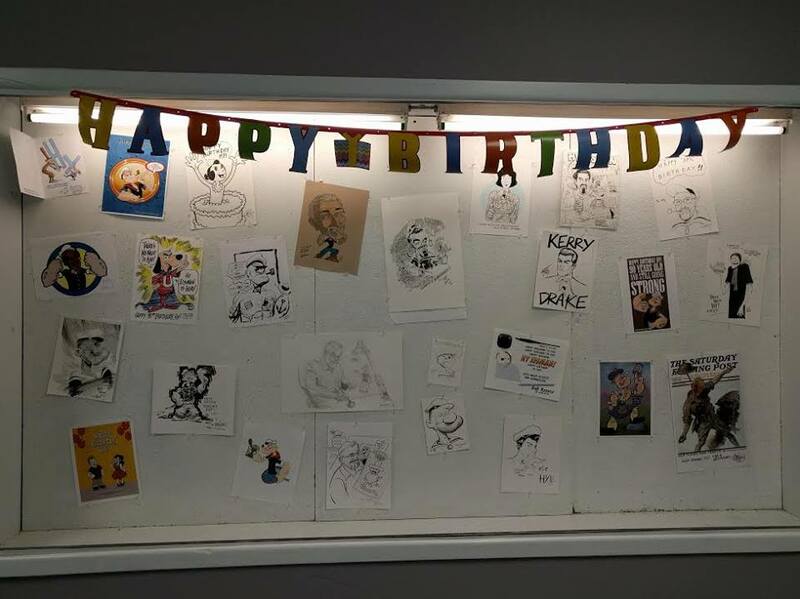 On Wednesday, March 22nd we celebrated Hy's 90th birthday with a schoolwide celebration that included two of our main display cases filled with art, cards and well wishes from colleagues, students, and former students, a third display case featured samples of Hy's work on several comic strips as well as personal drawings. Instructors and former instructors gathered for a pizza filled lunch and students were delighted by cupcakes in honor of this milestone. Comics Alliance does an interview with colorist and 2009 graduate Tamra Bonvillian. Saturday, March 18th is the Zapp Comics Con! Held in Wayne, NJ at Wayne Fire Co. #1, 93 Parish Drive. A number of Kubert School Student and graduates will be on hand doing sketches, accepting commissions, and selling prints and originals. 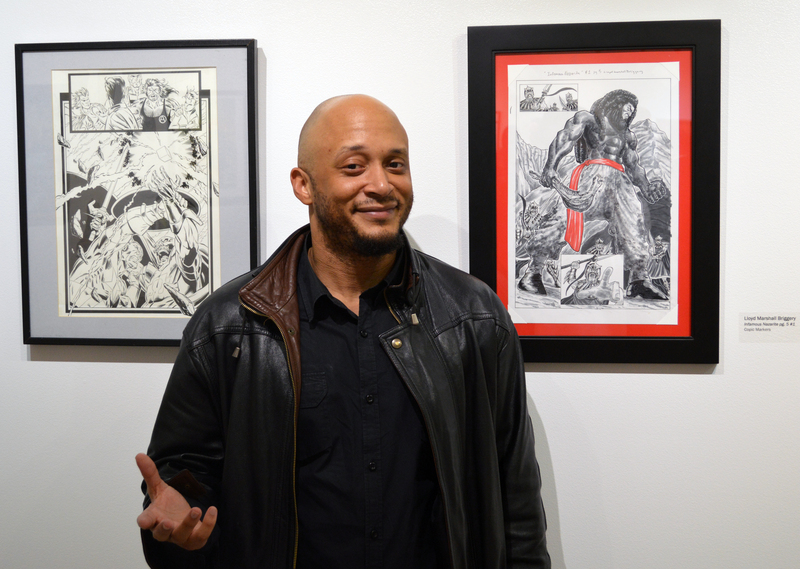 Graduate and current instructor, and artist on the current John Wick comic book, Giovanni Valletta. Recent grads, Wes St Clair, Minkyu Jung (Nightwing and Titans Annual artist), Nick Justus, Erik Klaus, Allan Watson, and Marki Wolfson. Current students, Brian Benjamin, Emma Kubert, Matt LeJeune, Sarah Madura, Eric Rossi, Dillon Snook, and Travis Williamson.